FoAM's first network-wide Open Studio happened during our international meeting in September 2018, this year hosted by FoAM Kernow in Falmouth, Flushing and Penryn. 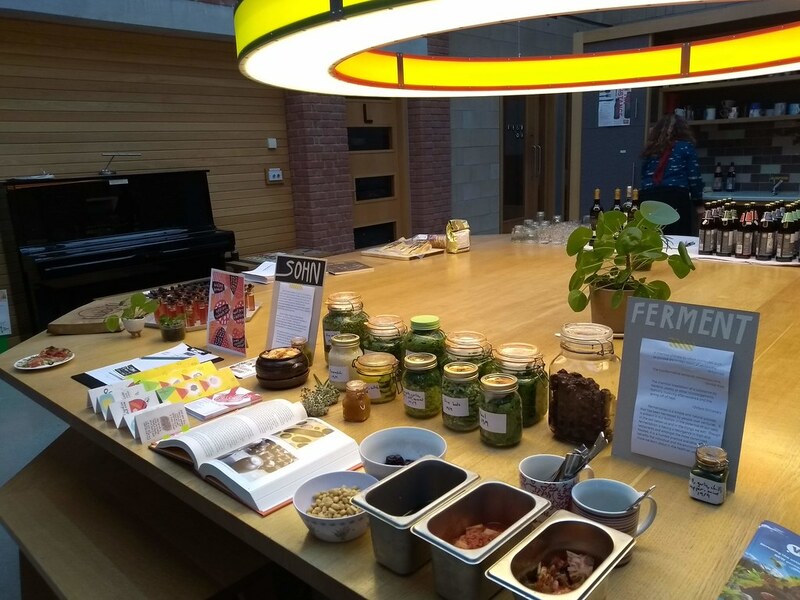 It brought together people from the network and facilitated connections between the FoAM members, local organisations, professionals and friends. The Open Studio was the first introduction of FoAM Filfla to the network and its audience. Our contribution to the event was a pop-up street-tea-party. We are hosting similar happenings in Malta as part of our "Parking Space Events" — a series of interventions exploring, practicing and commenting on the limits between public and private space. The event series explores different ways to occupy a single parking space as a public area, such as a concert venue or a performance stage. We conduct private rituals (like drinking tea) in public and treat public spaces as our private living rooms. We draw attention to the legal matters and question what being in-, taking over- or taking care of a public space might look like on car-dominated streets. For the Open Studio we didn't occupy a parking space but a public entrance. We setup a small table next to existing seating, just outside the FoAM Kernow studio. 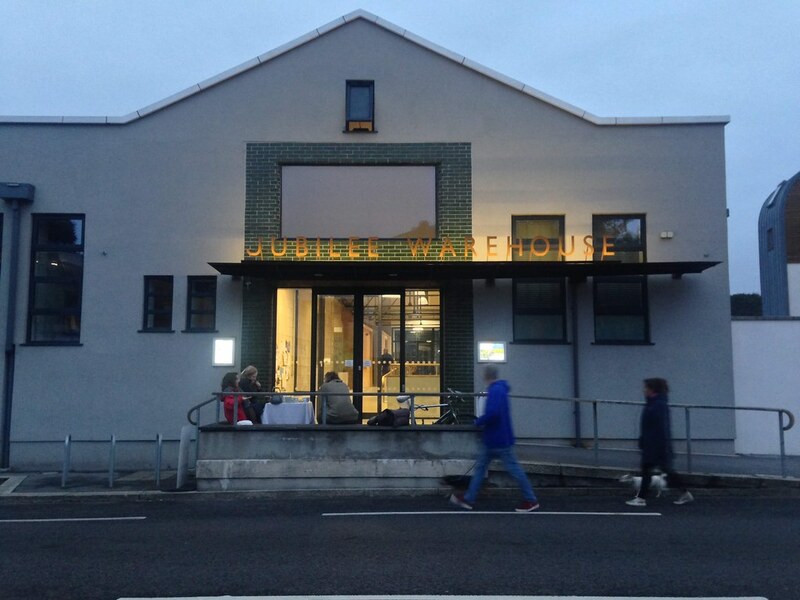 The tea party acted as the welcoming and transition between the cold and rainy streets of Penryn and the cozy and warm Jubilee Warehouse, inhabited by a cluster of startups and small organisations, ranging from copywriters to plant- and robot-loving and caring scientists. Passers-by looked curiously at our setup, most smiling at the invitation to sit and have tea on the street during a rather windy September evening in Cornwall. Some accepted our invitation and joined for tea (with or without milk) and ginger biscuits. A child paused just enough to grab a piece of fudge and hurried inside. Set right outside the building's semi-automatic doors (that would open by pressing a button that most seemed to miss), our presence turned into a door-opening concierge service, enhanced with the luxury of free hot tea. Conversations with the Open Studio guests and participating artists merged with chats with passers-by who'd pause their errand-running to have a cuppa and a natter with friendly strangers. Some passers-by decided to join the Open Studio, others continued on. It became a location for encounter, for shared experience with no predefined format except for an invitation to a comforting space to talk and be warm outside. The setup created the opportunity for many moments of intimacy - ones perhaps often reserved for loved ones in indoor, familiar gatherings. The intimate atmosphere continued when you entered the warehouse. The sweet, spicy and sour smell of kimchi prepared by Sohn Hoon Kim, Elizabeth Fortnum & Sean Meaden (www.sohnkitchen.com) would provide an olfactory welcome. The homely smell of fermented cabbage wafted through the space and scented the conversations, likely until the next morning. 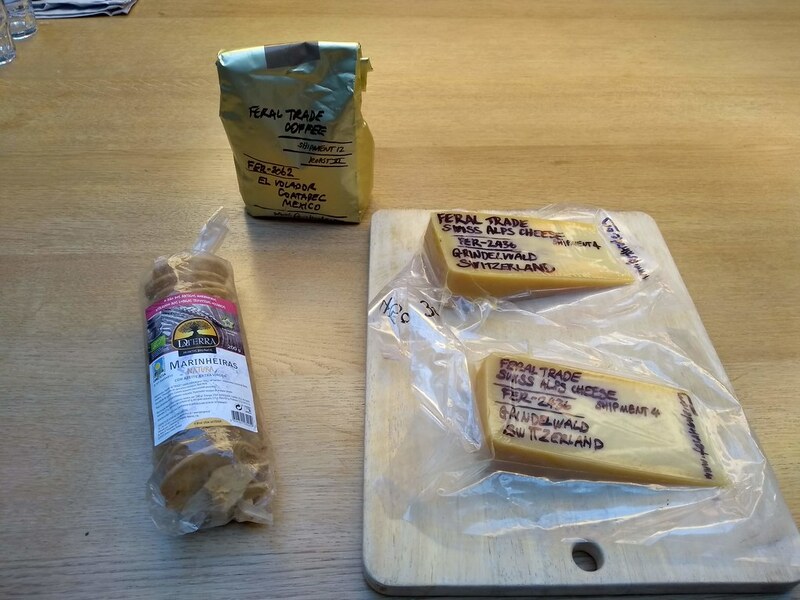 Culinary experiences continued around the table, with locally brewed craft beers and ferally traded Alps cheese, Mexican coffee and Sail Cargo's ship biscuits from www.feraltrade.org by Kate Rich. Those with a taste for stronger drinks could savour FoAM Kernow's new creation of gin with chocolate and locally foraged blackberries. Woven through the culinary feast there were a few specimen from the technologically poetic Pattern Matrix robot swarm by FoAM Kernow. 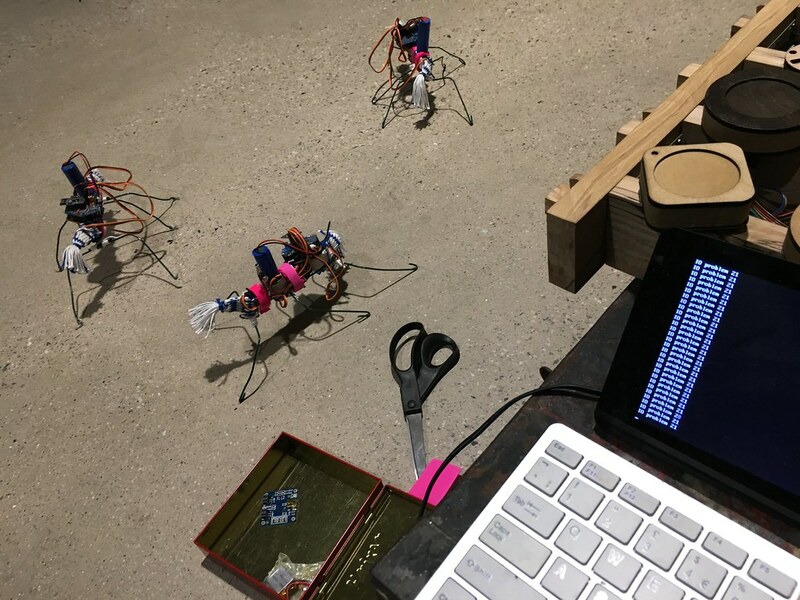 They danced a semi-erratic dance on the floor of the studio, astoundingly dedicated in their continuous and algorithmic movement. https://fo.am/activities/penelope/. FoAM Nordica presented their Bee Diaspora sound piece project as well as a documentation about the performance. Delicious Honey was posted from their apiary in Italy but only made it to Cornwall a few weeks after the event. 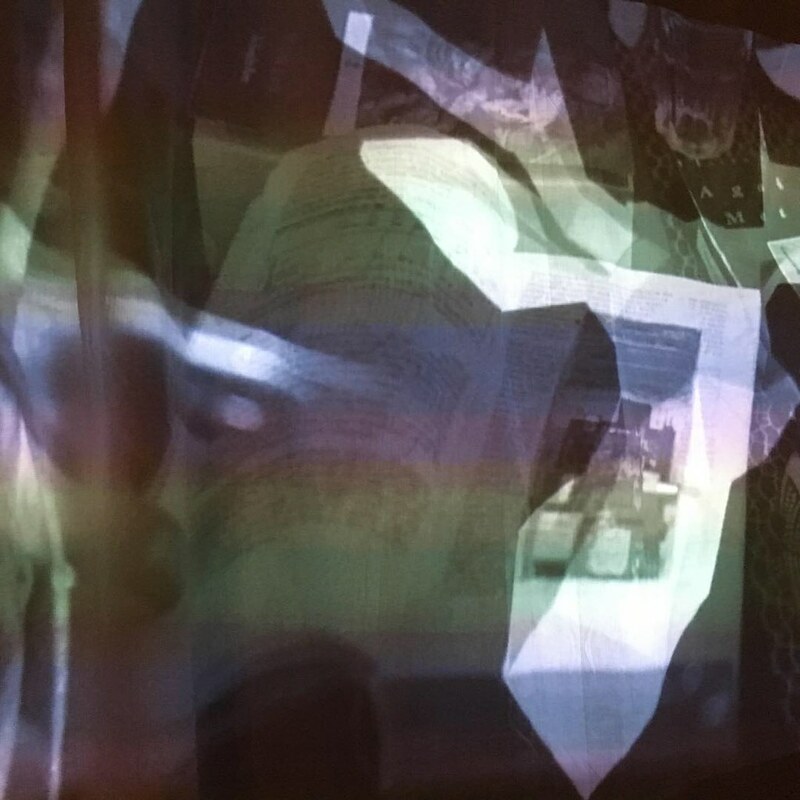 Ingrid Vranken from FoAM Brussels introduced the Rooted Hauntology lab and showed the trailer of Voice of Nature performance, due to be premiered in the spring of 2019. FoAM Amsterdam presented the Random Forests project by giving an impression of their fieldwork on the Terschelling island — their aim, the methods, outcomes and lessons learned. 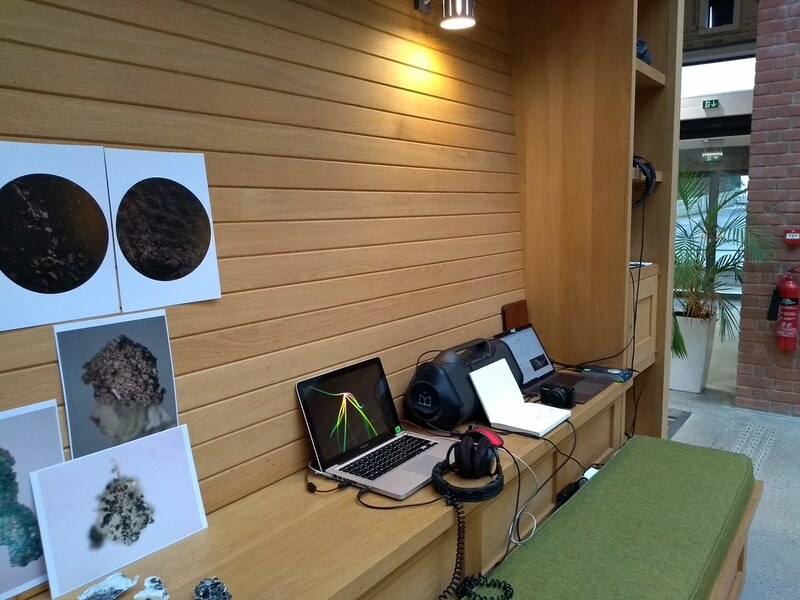 It was fascinating to meet Till Bovermann & Katharina Hauke (www.organisms.de), artists in residence of the invisible worlds (a collaboration between the Eden project and FoAM Kernow). They presented their field recordings as part of their work "...and then we see if we will be friends." 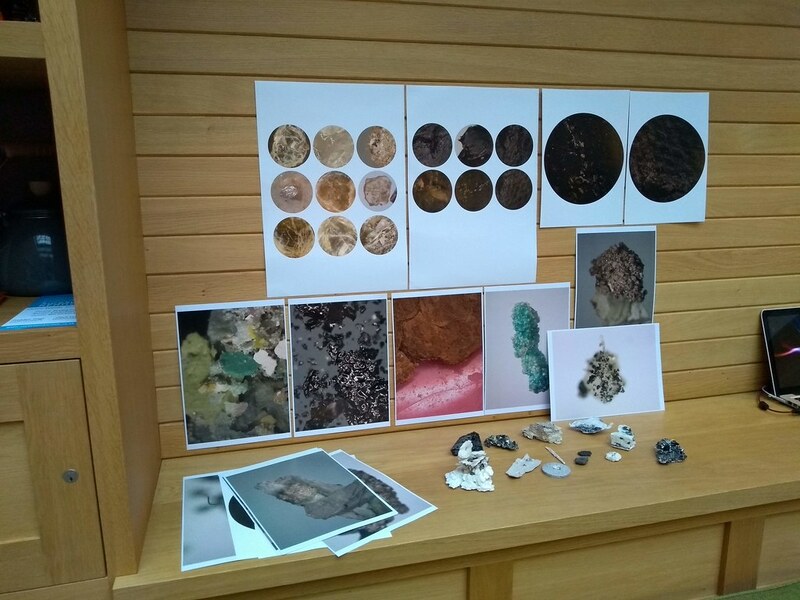 Next to their poetic field recordings and machinery, the third Invisible Worlds resident Rosanna Martin presented her work Disintegrated Rock — ceramic prototype models and geological imagery made under microscopes. 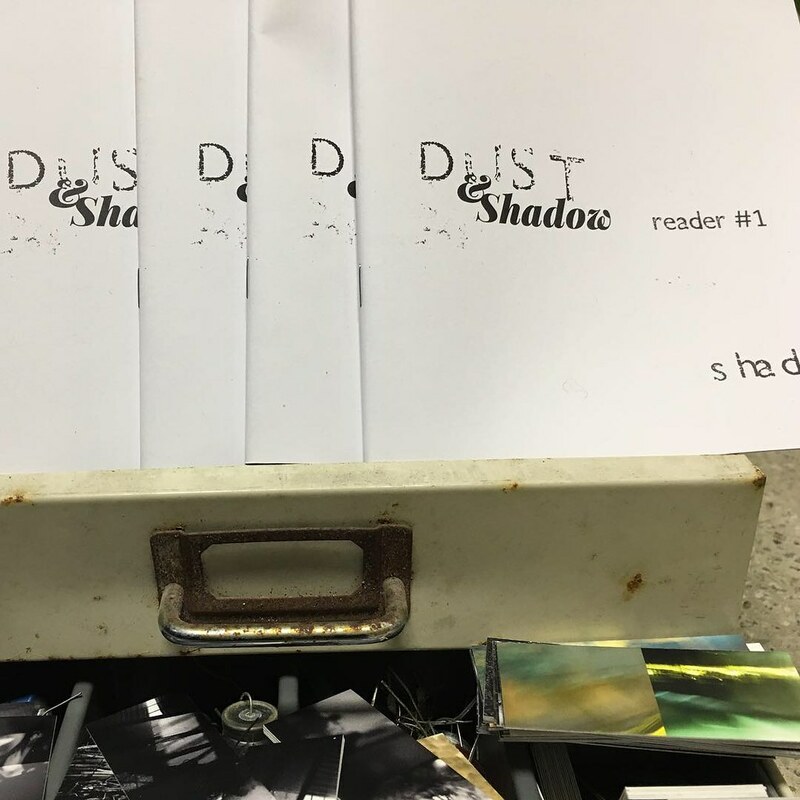 FoAM Earth released the first installment of the Dust & Shadow reader and played the soundtrack from their soundwalk. Occasionally the sounds of the desert would be replaced by the sounds from the Croatian Ephemeral Garden and atmospheric videos "in anticipation...". The visitors could browse copies the Open Sauces cookbook and the photographic impressions of Stillness. Stevie Wishart added to the soundscape with her intimate piano improvisation, tucked away just next to the main octagonal table. No recording was made but the group appreciated the live performance by either mixing their voices into it or listening silently. 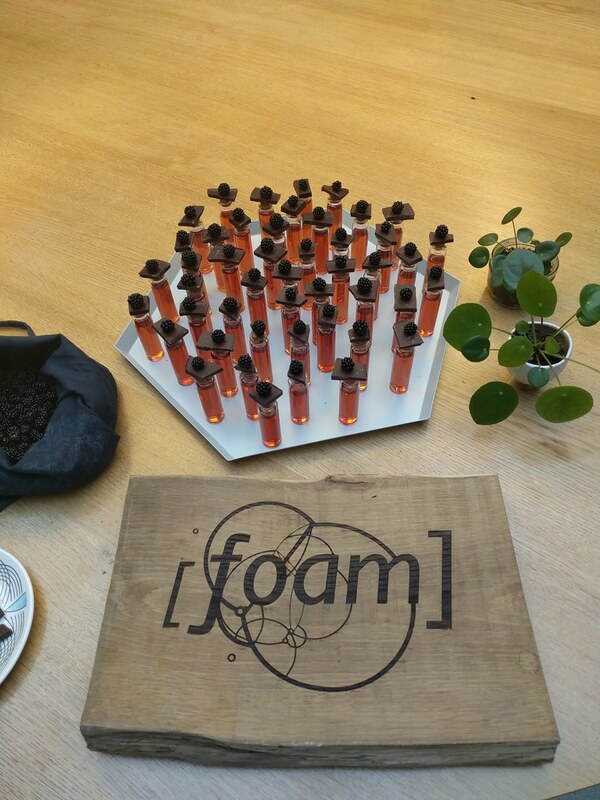 The Open Studio was our first public event with the FoAM network. We got to know the people involved and experience the works in their "native habitat". We felt welcome and encouraged to continue our collaboration, in the guise of our new studio: FoAM Filfla. The open studio is an inspiring format to introduce the different nodes of FoAM to each other and catch up with the projects current or recently completed projects, in a tangible and relatable way. 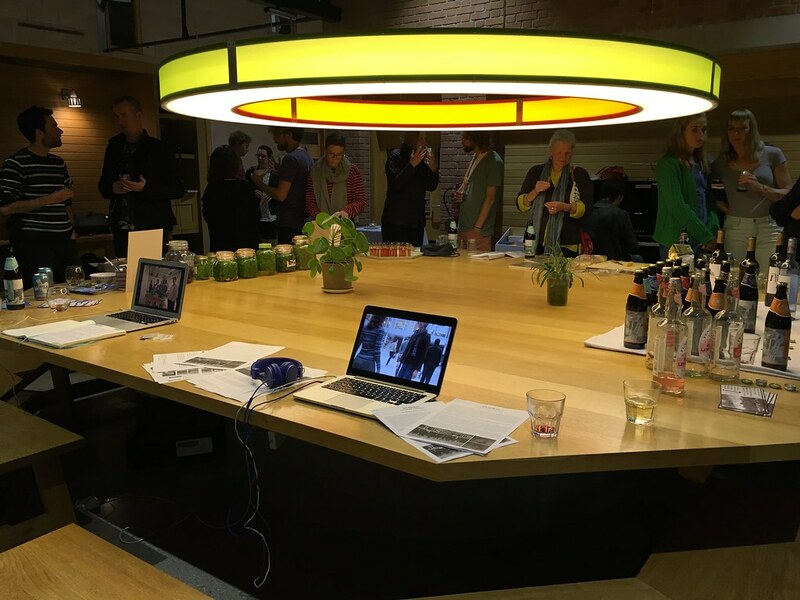 Easy access and fruitful exchange of ideas, music, sounds, vibrations and sharing food and drinks around a big table seems to be an ancient ritual that has not outlived its social value to trigger feelings of belonging.